Cameraman Phil Anderson sets the shot as actors Ashley C. Williams and Alex Platt prepare for a scene in Selene Hollow July 5 at Full Harvest Bar & Grill in Beacon Falls. BEACON FALLS — Something scary has come to this valley town. 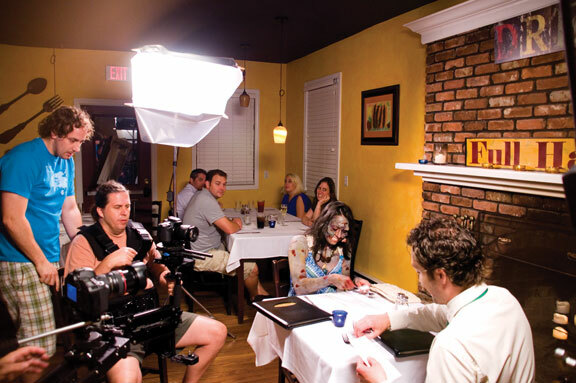 Last Thursday, the production crew of Selene Hollow, a new web series, took over Full Harvest Bar & Grill on South Main Street to film a scene. The restaurant was filled with the production crew, production assistants, extras, and actors, including Ashley C. Williams from the 2009 horror film The Human Centipede. Selene Hollow, which was co-written by Prospect resident Brian Trent, is a science fiction/thriller/comedy about a recently unemployed journalist looking to re-invent himself while living with his three new eccentric roommates. The pilot episode for Selene Hollow was filmed in April in Northfield. The crew didn’t film again for nearly three months until they came to Beacon Falls. Trent found Beacon Falls to be the ideal place to shoot his web series. Aside from the scene shot at Full Harvest, the crew also filmed at Matthies Park. “Beacon Falls is stunningly supportive of local films. From its local businesses to its fire department, everyone has been so warm and welcoming that we’re all eager to work with the town on future projects,” Trent said in an e-mail. Trent explained he reached out to Jeremy Rodorigo, the chair of the Economic Development Commission, when he was searching for a place to film Selene Hollow. “[Rodorigo] wasn’t merely accommodating, but was endlessly creative and encouraging. His value to us and to Beacon Falls is inestimable,” Trent said. Rodorigo was pleased with how the cast and crew of Selene Hollow responded to what Beacon Falls offered them. Rodorigo explained that, if he has his way, this will not be the only time a film crew comes to shoot in Beacon Falls. “What I’m trying to do and the Economic Development Commission is trying to do is bring more business and traffic into town,” Rodorigo said. When Rodorigo and Trent discussed the possibility of shooting Selene Hollow in town, Rodorigo made it clear what the stipulations for filming there were. “One thing I was emphatic about with Selene Hollow was, you bring your crew in, we have unique locations, we will be hospitable to you, but you have to spend your money here,” Rodorigo said. After working with Selene Hollow, Rodorigo went to the Office of Film, Television and Digital Media of Connecticut to register Beacon Falls in its database. “So now when film and television producers look to Connecticut, Beacon Falls is one of the locations they look to,” Rodorigo said. Selene Hollow is set to debut in the fall. Trent is satisfied with how filming for the first season of the show has progressed. “Our film crew has been remarkable — seamless and efficient and organized. Our first week was a whirlwind, and as writer and producer, I found myself on the phone as much as on set, trying to pull together all our resources to make sure the director, Mathew Provost, had what he needed, when he needed it,” Trent said. To help raise funds for the web series, Trent used a fundraising website called Kickstarter, which allows people to donate how ever much money they feel appropriate. Selene Hollow raised $8,575 on Kickstarter with the goal set for $8,500. “It was a tense nail-biter and took us right to the eleventh hour, but it had a satisfying conclusion. Fortunately, we had enough people who really wanted to see this project happen,” Trent said. He explained that Kickstarter was the only fundraising that the film did. The rest of the expenses were paid out of pocket. “Without the support of our fans, Selene Hollow would have likely remained a script gathering dust on top of a dresser,” Trent said.